Sale prices are the most used marketing technique in the world. Its no secret that a good discount on a product can push the customer over the edge of buying the product they wanted to have for a long time, or make the decision easier when they see the discounted product coming by. 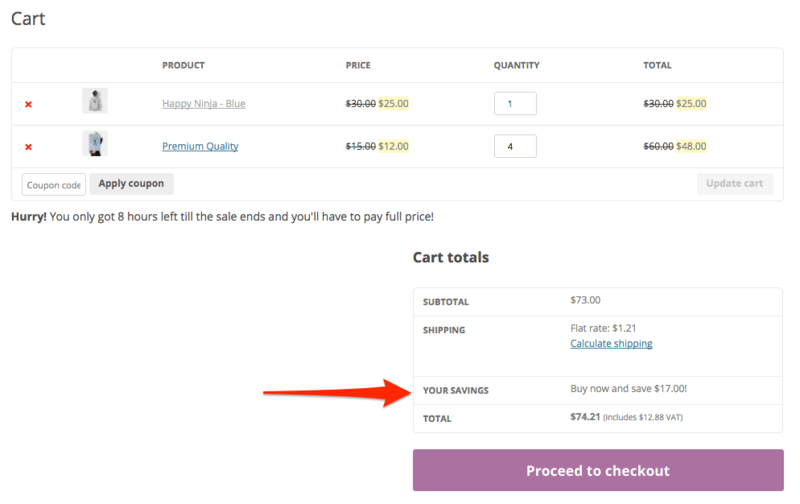 In WooCommerce the sale prices are communicated nicely on the product overview and detail pages, but nowhere in the cart or checkout! In this post I’ll show you how you can show the sale prices in the cart and checkout. It looks good and nicely emphasises the sale of the items. One catch; this does not take in account the tax setting ‘Display prices during cart and checkout’, it will instead take the same value as the ‘Display prices in the shop’ setting to show prices including or excluding taxes. If this is essential for your store you’d need to further customize the code snippet to represent the correct values. Pro conversion tip! Running a store wide (temporary) sale? Remember your customer this is sale price they’re seeing is only available for a small window. This will create a sense of urgency and fear of missing out, making them pull the trigger on the purchases faster. A message like this can be added dynamically through the Advanced Messages plugin. Okay, just one last thing you can do.. Showing the total savings at the totals table would be perfect. Nobody likes to do the math while it is interesting to know how much you’re saving in total. hello, where do i put these codes at? Is there any way to place at “Subtotal” too? In the cart sidebar. Just in the “Subtotal”, not the “Total”. Thanks for this! I’m wondering if it’s possible to also add this to the order confirmation email? Great 😀 only the checkout scripts results in a PHP error on line 40 somehow..
Amazing code, thank you for sharing Jeroen! Would you maybe wanna share how to make the sale prices that are not crossed a little bigger then the old price that is crossed or maybe with a extra space between the two prices? 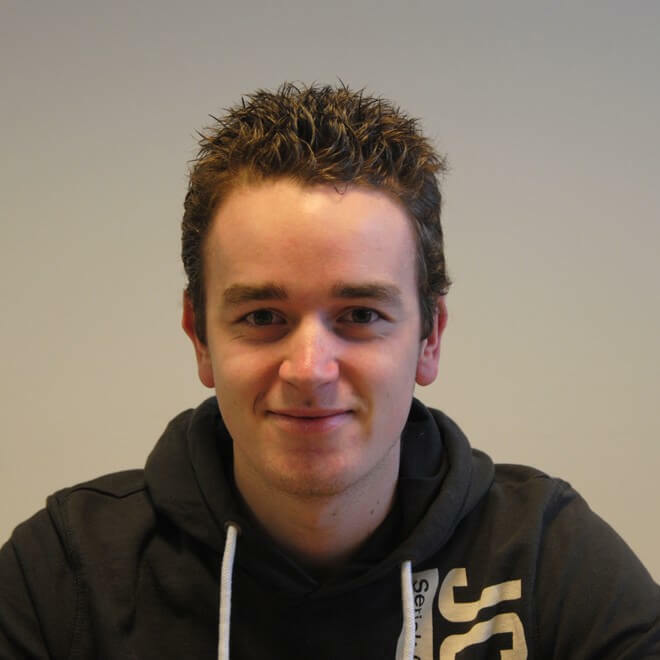 Thank you Jeroen, you are very helpful! I will directly give it a try! There should be a whitespace there by default, this is declared in the `wc_format_sale_price()` function. You can also give the selector some margin to create some additional space. I used the “YOUR SAVINGS” snippet and it works great. But i began using the plugin “Woocommece Dynamic Pricing” to give discounts to bulk buys and this snippet doesn’t account for it, it just calculates the Savings from the regular Woocommerce “Sale Price”. Any ideas on a little upgrade? Thanks again for the awesome plugins and code snippets, I use your awesome “Advanced Product Labels” plugins too. I posted a Reply earlier today saying it doesn’t work with Dynamic Pricing Plugin, but you just need to change “get_sale_price()” to “get_price()” since that is the final Product price in the cart after the Plugin does it’s calculations, worked like a charm. I hope i’m not doing something wrong! Thank you for great snippets Jeroen. I made a product price is free ( normal price: $189 and discounted price is “0”. ) and i directly copy & pasted in functions.php previously checkout page’s that product price displayed “0” but after that code displaying old price not such as your screenshot. By the way total price was true. Not sure what you mean with ‘checkout box’? I want to locate your snippet of : ” add $ more to get free shipping” in that box. How can I accomplish this? It is possible with either a custom code snippet or using my Advanced Messages plugin, I don’t have a snippet available ready to go for something like that though.